Cambria is a leading brand name of quartz countertop material and is the only quartz countertop made entirely in the U.S. Also called engineered stone or quartz stone, quartz countertops are made with natural quartz stone crystals combined with resins and pigments to create a stone-like material that offers some practical and aesthetic benefits over natural stone. Among all of the countertop choices today, quartz is an all-around top performer and is priced near the high end of the spectrum. Cambria's countertop options rival those of three other leading brands, Ceasarstone, Silestone, and Dupont's Zodiaq line. Based in Eden Prairie, MN, Cambria USA is a privately held family company. Currently, two family members, Mark Davis and Marty Davis, serve on Cambria's board and its leadership staff. Cambria is a relative newcomer to the quartz market, having entered in 2000, but it is the only American-made quartz countertop. The company prides itself on innovation and ecologically responsible manufacturing practices. Considered to be a premium brand, Cambria has only a few competitors in the upper echelon of quartz countertops. DuPont Zodiaq is an extensive line of quartz countertop materials from manufacturing giant DuPont, maker of Corian solid-surface countertops. In fact, as of January 2018, the Zodiac quartz line is now called Corian Quartz and is part of DuPont's Corian Design brand. This may lead to some confusion among consumers, who have come to use "Corian" as synonymous with solid-surface countertop materials, much like the brand name Formica has long been the generic term for plastic laminate. The Corian Quartz line includes 52 colors and patterns. Caesarstone claims to be the "original" manufacturer of quartz countertop material and has been in the market since 1987. The company is based in Israel. The Ceasarstone brand is known for design innovations, such as incorporating semi-precious stones into their countertop blends as well as styles with lush textures, like lace and crocodile skin. Silestone is a brand of the Italian company Consentino but is based in Almeria, Spain. Silestone is best known for its wide range of colors (upwards of 110) and particularly the vibrant solid colors in its Life!, Stellar, Mythology, and Zen series. Silestone also offers a long 25-year warranty on its quartz products. Slab Granite: Comparable. 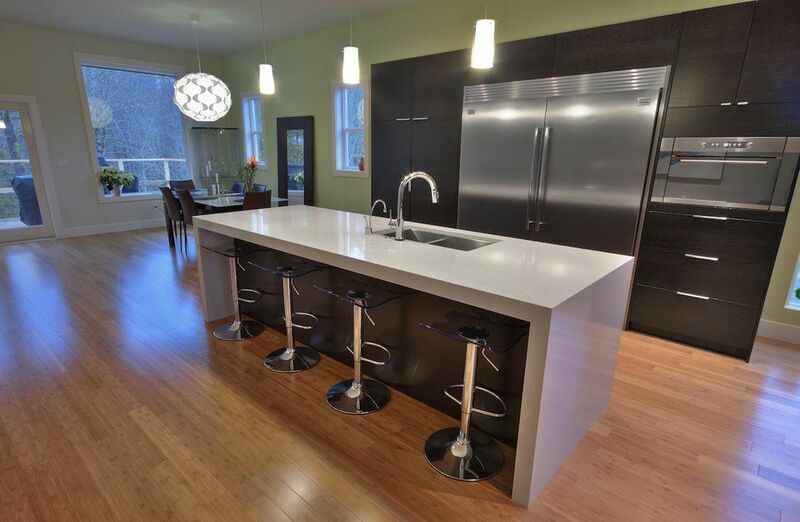 Quartz counters excel because they are both harder than natural stone and they provide more design options. Slab granite may have irregularities and soft minerals that weaken it, problems that are eliminated in the manufacturing of quartz. From a design perspective, quartz crystals and pigments can be combined to produce a wide range of styles, colors, and textures. You are not limited by whatever slab happens to come out of the quarry. Solid-surface: Somewhat comparable. Corian is the most prominent brand of solid-surface countertops. Solid-surface has a satiny, but plasticky, feel to the touch, while quartz feels more like stone. Solid-surface is generally less durable and scratches more easily than quartz. However, solid-surface is somewhat less expensive and is easier to work with, making DIY installation possible for a handy homeowner, especially if there are no seams in the countertop. Laminate: Not comparable. Cambria is a dense, solid counter material, whereas laminate is a thin veneer glued onto an MDF core. Laminate is considerably more hollow feeling and provides a vastly lower resale value. Laminate is a good performer for the price but is not as durable or beautiful as most quartz products.